Disability is not a bad word. Often times, our questions about what life is like when living with a disability go unanswered, because we're afraid of the topic. TEDxUofM's goal with this fantastic event, aptly held on the International Day of Persons with Disabilities, is to give our community a space for open dialogue to learn about disabilities, help remove stigmas, and better understand the people who live with them beyond their disability. 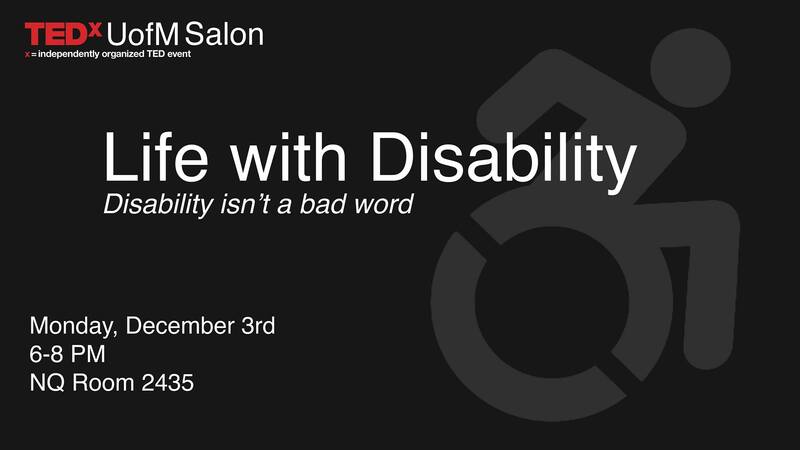 Our Salon will feature two TED talks and will host a panel of University of Michigan faculty, staff, and students with disabilities and/or who work in the field. They will share their stories with the audience and answer a few of their questions as well during an interactive portion of the night. TEDxUofM Salons are intimate, discussion-based explorations into specific ideas. They feature a speaker, a few TED talks, and animated discussions and activities to get you thinking about the world around us.